We are celebrating the 30th International AIDS Candlelight Memorial once more with a mass public yoga practice followed by a short Kirtan and candle lighting ceremony. 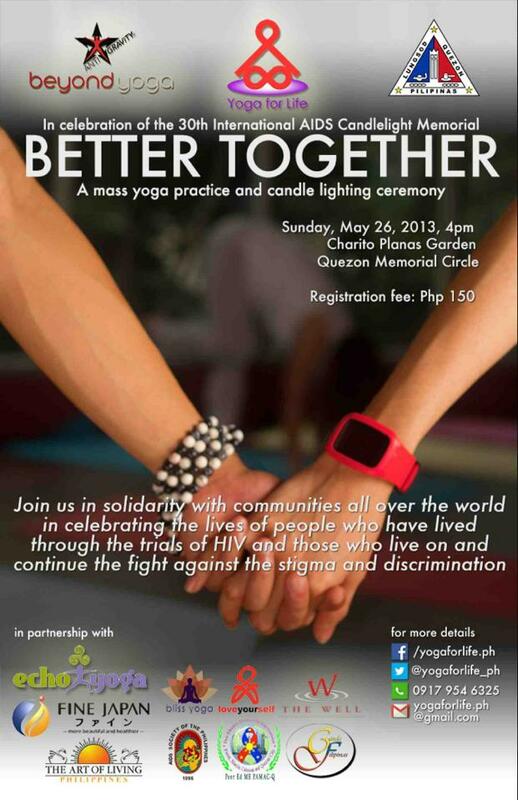 Calling the event, "Better Together", we aim to bring solidarity within the HIV advocacy community and also reinforce the beauty and transformative power of our yoga practice in helping groups and individuals affected by HIV and AIDS. See you on May 26, 4pm, at the Charito Planas Gardens in Quezon Memorial Circle. Registration Fee is Php 150. Proceeds will help support Yoga For Life's advocacy towards assisting more people affected by HIV/AIDS.